Kaju Katli in 10 minutes at home with tried and tested recipe. 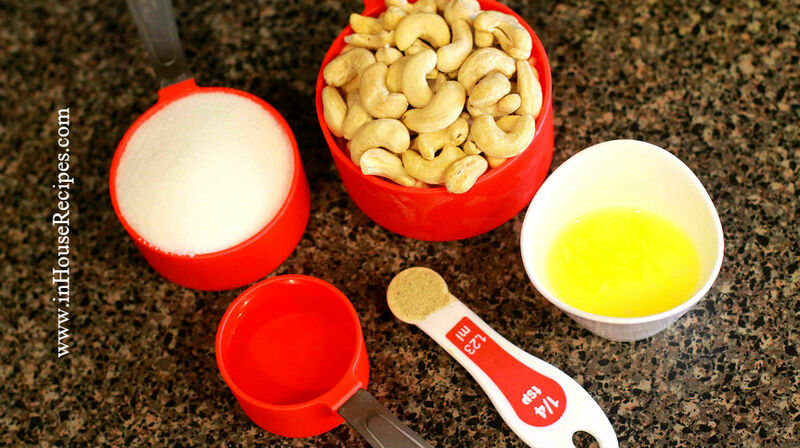 Use cashew nuts and sugar as main ingredients. Roast and make Kaju barfi easily. 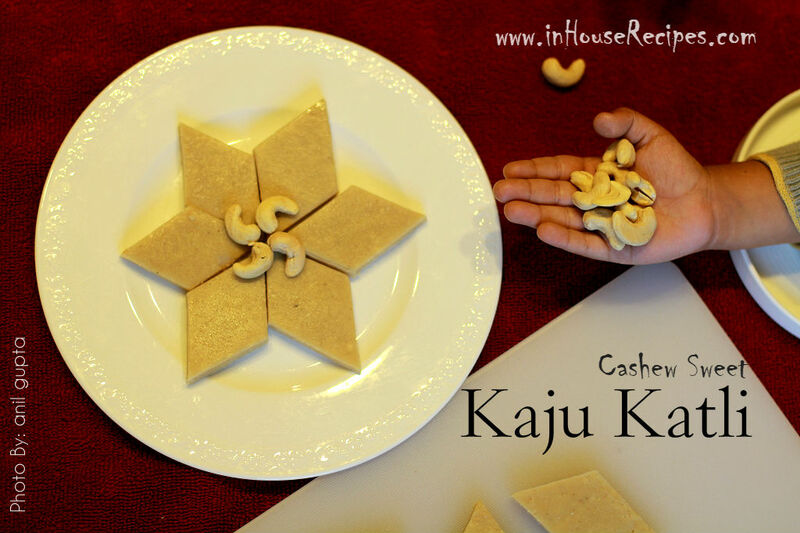 Kaju Barfi or more commonly known as Kaju Katli in northern India is a sweet dessert and can be termed as Cashew Fudge. It certainly needs no introduction and has been the most preferred gift on the occasion of Diwali gifting. It comes under the elite list of desserts due to its high price as well. Since it is made with cashew nuts, even a small amount would cost you a good amount. The one we buy here in Boston is a ready-made Haldiram's Kaju Katli and is priced at $8. But, if you believe and try this recipe at home, you would get much more with same cost. This is our tried and tested recipe to get ready with your sweet in about 10 minutes. You should be ready with the ingredients at this time. 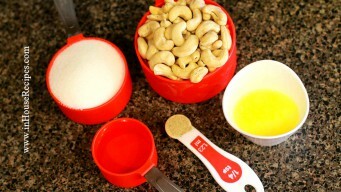 Grind Cashew in a clean jar with no earlier residue and smell. 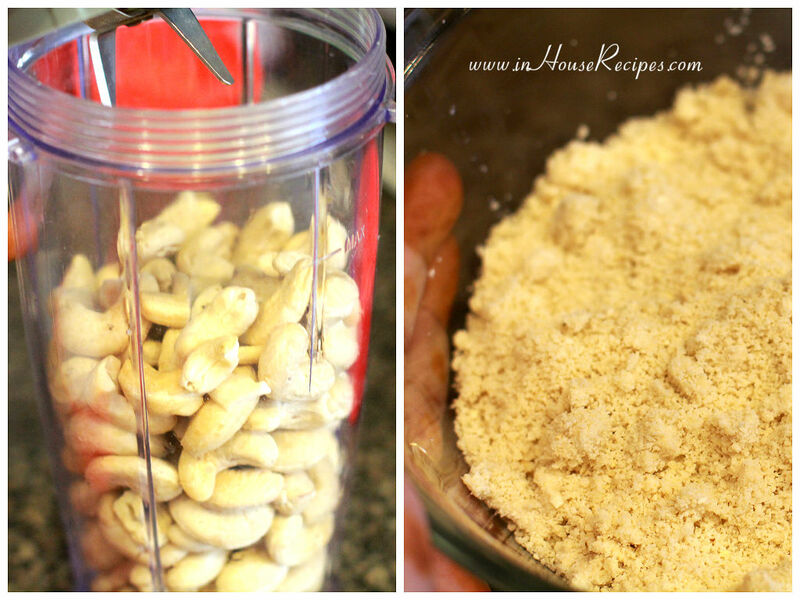 Add Cashews in dry blender Jar. No water droplets allowed. Also make sure that jar has no bad smell or anything left on the corners. You know sometimes there is stuff left un-cleaned on those un-reachable points within the jar. If it is there, clean it first if you want to taste and smell only Cashew and nothing else in Kaju Katli. Grind well to make a powder. Keep aside for later use. We are using powder sugar to make sure there are no sugar-chunks in the final kaju Katli to spoil the taste. 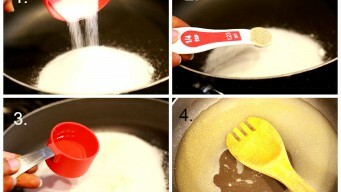 You can pretty much use the normal sugar that you use in daily life. Since, we are going to use heating, sugar is bound to melt and would not make a big difference to which one you actually use. Its just that we want the final result to be perfect and hence are using the powdered one. Add sugar, water, cardamom to pan for kaju katli Add Sugar, Water and Cardamom Powder in a pan. The pan should be big enough to hold all this stuff together and have some space for holding boil too. Turn ON the stove on high flame and wait for the first boil. It should take about 2-3 minutes. After the first boil, turn the stove to medium flame. Let it cook for 2 more minutes. Stir Occasionally. 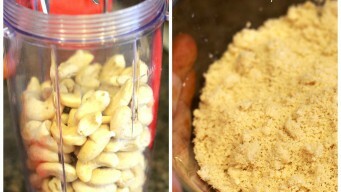 After 2 minutes, add Cashew Powder and mix well. 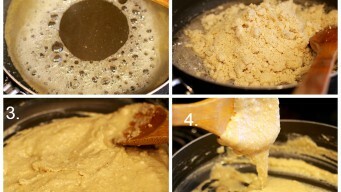 Mix it well and remove all visible lumps. Keep on cooking on medium flame for about 5 more minutes. Stir continuously. After 5 minutes, turn OFF the stove. Kaju Barfi paste is now ready. It needs to be given a shape and that exactly what we are going to do next. 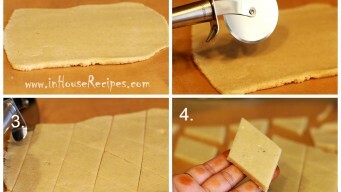 You would need a butter paper or a parchment paper for this step. 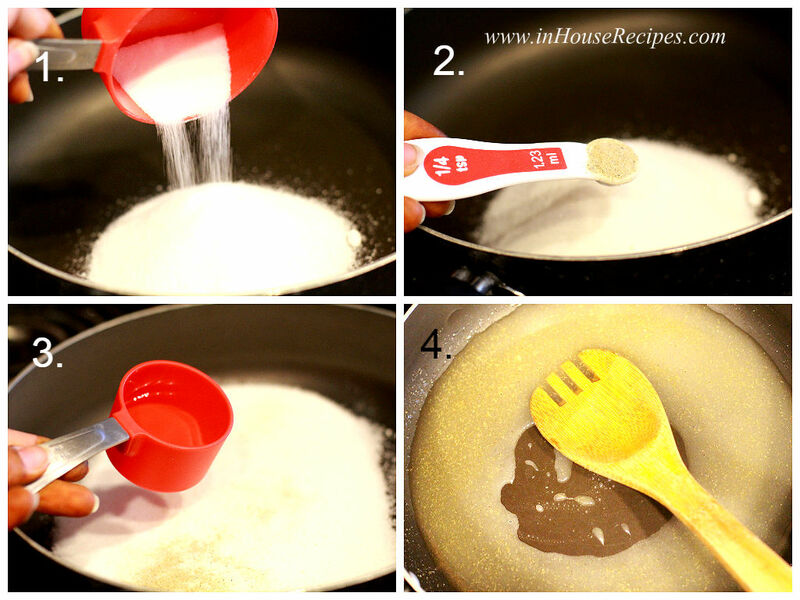 They are basically used to provide a greasy layer between the utensil and the paste to avoid sticking to each other. Normally, in cake recipes we use a casual substitute called butter. But, here the butter may not be as fruitful. 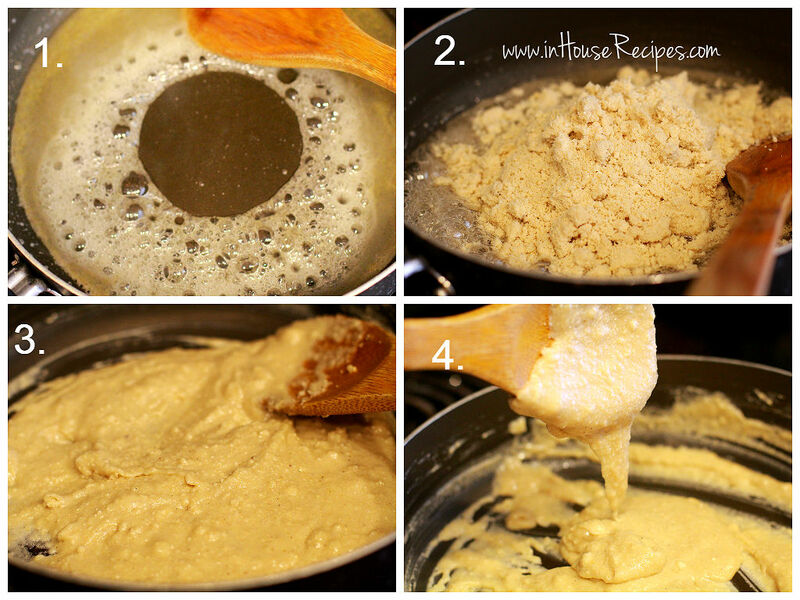 Grease the butter paper or parchment paper which ever is available with 1 Tsp of Desi Ghee. Pour or spread the Kaju barfi paste on this paper. 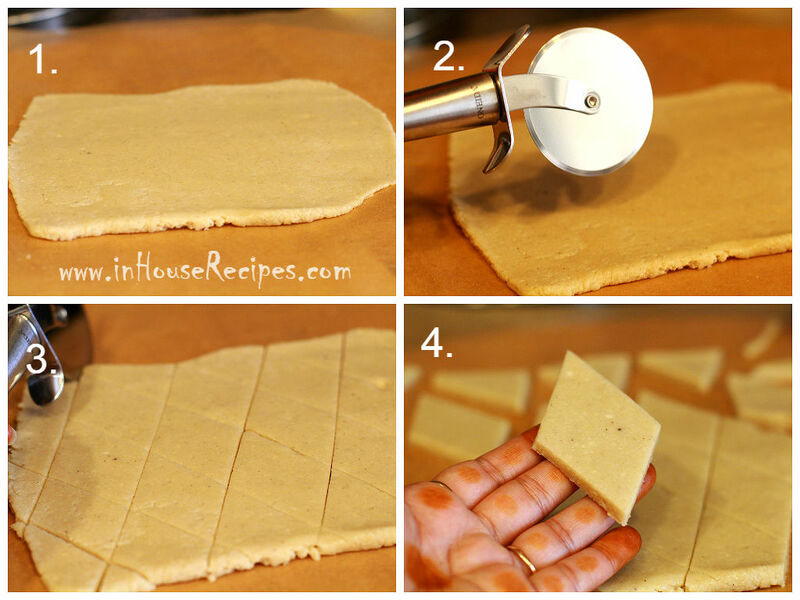 Fold one side of paper and cover the Barfi paste. 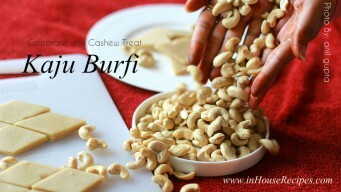 Press the Barfi paste with your hand and flatten it a bit. Now, use a rolling pin to flatten it evenly all over. Once done, Use a pizza cutter for best results or a sharp knife to cut the Barfi in diamond shape. 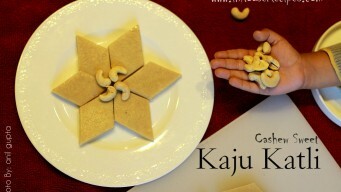 Kaju Barfi or Kaju Katli is ready to serve. 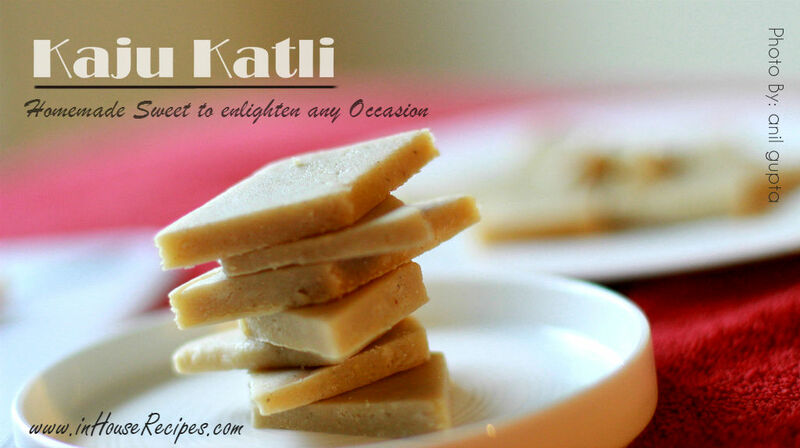 Kaju Katli needs refrigeration for increased shelf life of about 20-25 days. Although, it can be refrigerated and preserved for longer times, it is recommended to consume it within 5-6 days for best taste. You can heat up the kaju barfi in microwave for about 10 seconds if you want to serve them just after taking out from refrigerator. If you have some spare time, we would recommend keeping it out of refrigerator for about 30 minutes before serving. This helps in bringing it to room temperature and get softer for chewing. You can also use silver foil on top of the Kaju Barfi before serving. It is a personal choice. It does not add anything in the taste in particular but makes it look attractive. You can get this silver foil in any Indian grocery store if you are outside India.